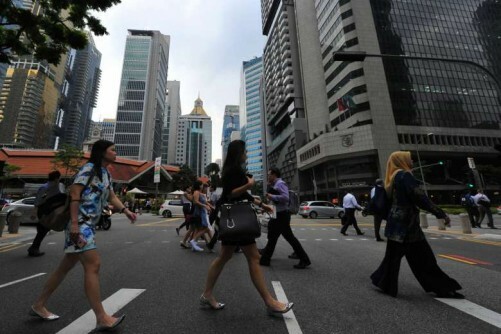 SINGAPORE - Singapore's job market was boosted by growth in the field of technology, even as there was slight decrease in job advertisement volumes, as hiring was at optimistic levels in Asia, according to the Asia Job Index for the third quarter of 2016. However, there was zero change in online hiring activity between October 2015 and 2016, according to Monster Employment Index (MEI) by online employment site Monster.com. The MEI's findings, released Tuesday, also found a 13 per cent hike in hiring activity in the IT, Telecom and BPO sectors, while the steepest drop of minus 9 per cent was in banking, financial services and insurance sector. Professionals in software, hardware, Telecom jobs are in the greatest demand at 25 per cent while human resources and administration roles registered the steepest drop at -11 per cent. On the other hand, the Asia Job Index piblished Tuesday by international recruitment consultancy Robert Walters, tracked job advertising volumes for professional positions across leading job boards and national newspapers in China, Hong Kong, Taiwan, Malaysia and Singapore. "The slight decrease in job advertisement volumes in Singapore was reflective of a changing economy. Sectors like manufacturing, residential property and shipping have come under duress as companies undergo restructuring to cut costs," said Toby Fowlston, managing director of Robert Walters Southeast Asia section. "However, there has been positive growth in the technology and e-commerce field as businesses improve customer engagement and shore up their security practices, resulting in more job opportunities available for user experience and user interface designers, and cybersecurity professionals in particular," he added. He also said that HR teams in Singapore are getting leaner, but companies are still recruiting for roles in talent management, leadership & development and compensation & benefits. The report also said that Singapore government's plans to boost the local start-up ecosystem led to a 24 per cent rise in recruitment activity for the Information Technology job market, and companies who embrace digitisation will have high demand for technology professionals with experience in developing the latest platforms. There was also sustained demand for professionals within financial crime experiece, the study stated. However, there was a 36 per cent dip in job opportunities for merchandising and purchasing functions as organisations moved to lower-cost locations outside Singapore. Jobs in compliance and legal sectors also suffered due to cost-cutting measures, it added. In Hong Kong, companies were more open to contract-hiring, while in Malaysia hiring slowed down as a result of uncertain economy. Hiring in China, on the other hand, was robust for high-quality talent, the report said.